Use our safety signs to keep everyone posted on the job site or at work. 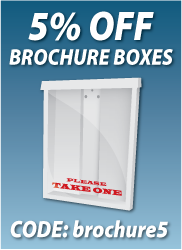 Select any of our pre-designed templates or customize your own sign. Standard OSHA 7"x10 & 14"x20" sizes. Available sizes: 14"x20", 10"x14", 7"x10"
Our 14"x20" safety sign is made of .040 durable aluminum and oversized when extra visibility is needed. Be sure to add the "Double Sided Tape" option to make it easier to place on a wall. Our 10"x14" OSHA standard sign is made of .040 durable aluminum. Be sure to add the "Double Sided Tape" option to make it easier to place on a wall. Our 7"x10" OSHA standard sign is made of .040 durable aluminum. Be sure to add the "Double Sided Tape" option to make it easier to place on a wall. Convenient for bonding small signs and placards. Specially designed adhesive for easy removal. Hang safety and information signs in offices and warehouses.